Home Transportation A New Metro Extension Could Seamlessly Connect L.A. and the O.C. A New Metro Extension Could Seamlessly Connect L.A. and the O.C. A community meeting happened last week with Norwalk and other southeast county residents discussing a long-desired project—connecting the east end of the Green Line light rail with the Metrolink (commuter rail) station that’s a heartbreaking 2.8 miles away. Locals seemed mostly supportive of fixing this problem, according to Urbanize LA. 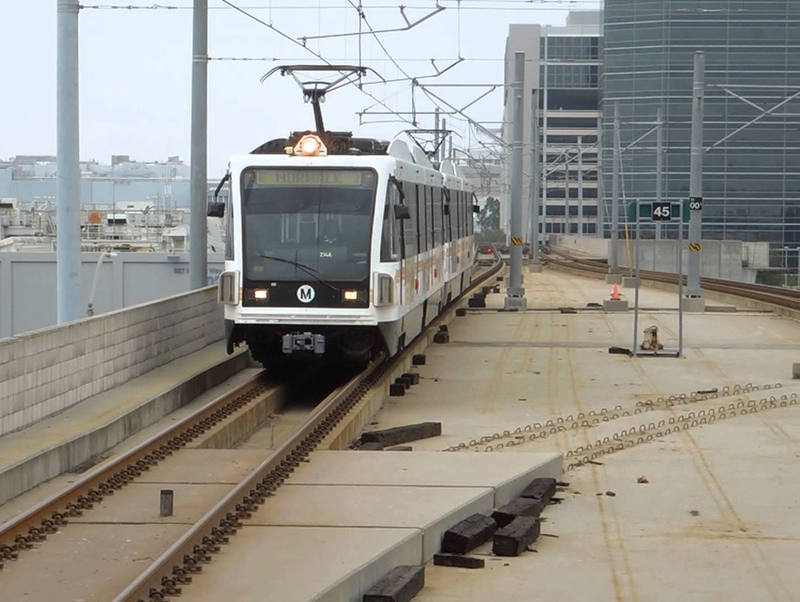 The connection will allow travelers from Orange County to directly access the Green Line via a Metrolink train, and then make their way to LAX or connect to DTLA or Santa Monica. The Green Line is often billed as a “train from nowhere to nowhere”—as it dead-ends in Norwalk near the intersection of the 105 and 605 freeways and, to the west, in a relatively desolate part of Redondo Beach—but this project could make it go somewhere. Funding is in place, but decades away, as it is for other projects earmarked for Measure M money. This advance planning means the agency can try to speed up projects with federal cash infusions—like the one they just got for the Purple Line subway. In the next year or so, planners will decide whether the Green Line extension will be built above-ground or in a tunnel. They’ll also decide whether to add an extra station between the existing one in Norwalk and the proposed terminus near the Metrolink stop. A fix for the Green Line’s western dead end in Redondo Beach is in the works, too. An extension will connect the train first to the South Bay Galleria and, eventually, to a new transit center in Torrance. A Green Line that begins at a Metrolink station in Norwalk, connects to the Blue Line and LAX, and terminates in Torrance will be an incredible asset for the region. Metro is aware of other “gaps” that need connections. The Red Line terminates in NoHo, just a few miles south of the Bob Hope Airport in Burbank (Metro has long-term plans to address this). Meanwhile, the Gold Line misses the Rose Bowl (no plans to fix that at the moment), and though the Expo Line stops in downtown Santa Monica, it would do wonders to connect to Venice (but that won’t happen in our lifetimes).